For those of you who follow our blogs, you know well that this is a topic of interest for us. It bears repeating – our job as lawyers is to properly investigate potential claims of malpractice in areas such as cerebral palsy and seek redress for our clients when the evidence demonstrates a connection between birth injuries and medical care, but the much more important topic for our clients and victims of cerebral palsy is in the field of medical research. It is through research efforts – including clinical trials – that this dreaded condition will be ameliorated and hopefully eradicated. Trust me, after practicing law for over 35 years, I’m not worried about job security – the frailties of the human condition will more than suffice to fill our file cabinets with people to help due to the negligence of others. We have reported previously on various topics involving cord blood and stem cell research as they relate to a number of conditions, including cerebral palsy. It seems that months have passed since there has been any significant news about two programs underway: one at the Medical College of Georgia and the other at Duke. Earlier this month, an update came across the social media network via a post by Singularity Hub – Cord Blood Stem Cell Treatment for Cerebral Palsy in Clinical Trial | Singularity Hub. Here’s our encapsulated version regarding the studies and Singularity Hub’s report. While other aspects of processing and administration are no doubt part of the key components of this project, it is readily apparent that the end-point goal is discovery of an effective treatment of cerebral palsy for the identified neonates in the study and then development of a second stage clinical trial to take such treatment modality to a greater number of potential beneficiaries. For detailed information on this study, which began in February of this year, similar information is available through ClinicalTrials.gov under identifier NCT01072370. This clinical trial investigation has a patient population consisting of children from ages of 2 to 12, “whose parents have saved their infant’s cord blood, who have non-progressive motor disability, and whose parents intend to have a cord blood infusion.” Again – for full details regarding inclusion and exclusion criteria, see the full online posting. Today’s report from Singularity Hub provides some encouraging – albeit anecdotal – news of potential progress. The anecdotal evidence in support of treating cerebral palsy with cord blood stem cells is astounding. Much of it has actually been been performed at Duke University by one of the investigators in the pilot study: Joanne Kurtzberg. Among those that have been successfully treated at Duke include Ryan Schneider, Maia Friedlander, Chloe Levine, and Dallas Hextell. All had CP or CP-like symptoms and all made remarkable recoveries after cord blood stem cell treatments. Dallas Hextell, who showed improvements just 5 days after his therapy was featured on the Today show (the original report contains video compliments of MSNBC). In addition to the early good news coming out of these projects, one other lesson is learned – for the time being, the storage of cord blood is an important component for those hoping to participate in such studies – particularly that being conducted at the Medical College of Georgia. We have earlier reported on this topic as well. You may want to refer to our early posting for some basic information if you are interested. So we have some exciting news for cerebral palsy, and some exciting news for those thinking about cord blood. What about the rest of us? Well the MCG and Duke work has some far reaching implications. Neurological damage, whether it’s caused by oxygen deprivation or some other injury, is one of the most difficult things to heal in the body. Work in animals (like that done by Carroll on rats) show that stem cells can not only help damaged brain cells recover, but they can also replace cells that have died. We may find that stem cells therapies have a wide range of applications for many different forms of brain damage. Kurtzberg is researching many different ways cord blood could be used (autologous or through donors) to treat a variety of conditions. 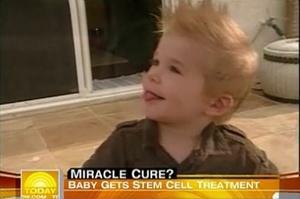 In other words, today stem cells conquer cerebral palsy…tomorrow, the world. Let’s all hope that Mr. Saenz is a prophet. Have you ever wondered how people get in clinical trials? Well, you should check this out. Are you aware of clinical trials that may be in your neighborhood? I just happened to come across this link to clinical trials. Perhaps you are a lot more savvy than I (which would not surprise me one bit), but you can get ongoing information on these clinical trials by going to a website called Clinical Connection. For example, there’s one in Baltimore for overweight folks being conducted at Harbor Hospital involving a new investigational medication. In fact, if you go to this link, you will see that there are over 15 clinical trials for all types of conditions in the Baltimore area alone. If you are willing to travel 50 miles or less, there are even more in which you can enroll. Do you have moderate or severe pain from osteoarthritis of the hip or knee? Well Annapolis just might the place for you to visit and try out a new drug. You have to be over 18 years of age and according to the website, “study participants may be compensated for time and travel. All study-related care is provided at no cost and health insurance is not required to participate.” I don’t know what “may be compensated” means – but if you are interested, check it out. On the national level, the home page of Clinical Connection says there are 105,555 clinical trials underway – and there’s probably at least one in your neighborhood. Do you suffer from chronic low back pain of greater than 3 months duration? That’s right – there’s a trial for you taking place at 7 locations, including California, Arizona, Florida, Washington and Nevada. You name the condition – there just may be some free study out there waiting for you to volunteer. These programs undoubtedly have very extensive packets of information about the study guidelines and the risks and benefits of the drug or therapy under study. These trials are called clinical trials since the manufacturer has presumablyjumped over the hurdles of early non-clinical research in order to take the next step – how does our product work with real people? Make sure you understand what you are signing up for before doing so. Who knows, it may turn out that you get some real benefit from participating – hopefully you will not be a statistic in terms of adverse outcome. Just take time to understand what you are getting yourself into and what rights you are waiving. If you’re good to go, we wish you well! You are currently browsing the archives for the Clinical Trials category.